Réservez cette visite privée d'une journée des chutes du Niagara au départ de Toronto et profitez du spectacle en compagnie de votre famille et de vos amis (six personnes au total). Voyagez dans la vieille ville de Niagara-on-the-Lake, visitez deux établissements vinicoles de votre choix et découvrez autant d'attractions que vous le souhaitez à Niagara Falls. Les guides pour cette tournée sont nés et ont grandi à Niagara - ce qui signifie qu'ils connaissent les meilleurs itinéraires viticoles et restaurants, ainsi que les tenants et aboutissants de ce qui rend Niagara inoubliable. Les frais pour les dégustations ne sont pas inclus, mais toutes les taxes, les suppléments pour le carburant et les frais de service sont inclus. Niagara est une destination dynamique quatre saisons: la région compte 20 musées historiques, des plages au bord d'un lac, des terrains de golf de classe mondiale, des parcs aquatiques intérieurs passionnants, des sentiers de randonnée à pied et à vélo et plus de 100 établissements vinicoles de renommée mondiale. Lors de cette visite privée au départ de Toronto, créez autant de souvenirs que possible lors de cette visite d’une journée complète à Niagara-on-the-Lake et à Niagara Falls. Rendez-vous dans la magnifique vieille ville pittoresque de Niagara-on-the-Lake, où votre guide vous conseillera en toute connaissance de cause sur les endroits où acheter et manger. Visitez deux établissements vinicoles de votre choix à proximité, puis conduisez le long de la promenade du Niagara, en vous arrêtant comme bon vous semble pour des séances de photos. 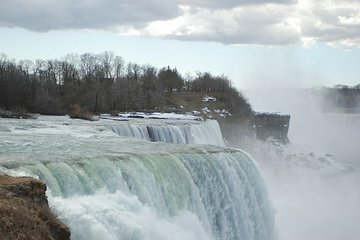 À Niagara Falls, visitez autant d'attractions que vous pouvez: les gorges, les chutes Rainbow, le voile de mariée et les chutes Horseshoe. Partez en croisière avec Hornblower, découvrez les Whirlpool Jet Boats ou promenez-vous dans Clifton Hill. Veuillez noter que le prix du circuit par véhicule est compris entre une et six personnes. Les dégustations, les droits d'entrée, les croisières et les achats de nourriture ne sont pas inclus. Les prix incluent toutefois toutes les taxes. Daryl was a fabulous tour guide. Made our trip exactly what we wanted it to be! We were able to customize the tour and fit in everything we wanted to do. Best way to visit the falls and see surrounding area if you only have a day. Our driver was fantastic, very accommodating and knowledgably. All recommendations were spot on. A tad costly, but, worth it. The Private tour was outstanding. Daryl Moore from Wheelz Niagara (local tour company the Viator arranged for us to have) picked us up bringer and early in Toronto and we headed to Niagara-on-the-lake to do a private tour of several wineries (big and small) in the area. Daryl was very knowledgeable. I booked this tour for my parents as a part of their surprise holiday to go see some Blue Jays games. Steve was awesome. He emailed right after I booked to give me an idea of what the day would be and how the driver would customize to what my parents wanted to do. My parents said this tour was the highlight of their whole trip! Darryl the driver was a blast, easy going and was very informative . He took my parents to many spots for views of Niagara Falls that any other tour wouldn't get to see. They didn't do the Hornblower as it was a cooler day but thoroughly enjoyed Journey behind the falls. They toured a few wineries and overall the day was a blast. Thanks Wheelz Niagara! Our driver, Darrell, was on time, froendly, accommodating, and knowledgeable. He offered options, and let us customize our tour and plan our time. Steve, the owner, met our car with tickets for our one add-on tour behind the falls. He saved us time, and also recommended a vegetarian-friendly place to stop for lunch. Our party of four was very pleased! Thank you for a perfect Niagara day! This tour was fantastic, we were asked what we wanted to do and were given several options when we weren't too sure. The tour was also variable on the day as we were asked by the driver Daryl if there was anything else we wanted to do. Daryl the driver was friendly, informative and even had a good sense of humour. A very easy pick up and drop off from our hotel was great as we had limited time available. This is the way to see the Falls!!! Before we even arrived Steve communicated via email to make sure we knew all of our options and setup the pickup time that WE wanted. When the tour day arrived Daryl picked us up promptly at our hotel. He had water for us and we were off to the falls. He took us to various spots for some amazing photos and then we were off to a chocolate fatory tour. Daryl took care of everything when we arrived and we had a private tour of the factory. Then he found the perfect spot for lunch we ate and were off to see three different wineries. All that and he still got us back in time to freshen up and make our dinner reservations!!! Fantastic day overall, highly recommended. Very helpful and accommodating throughout the day. We were all very satisfied and thoroughly enjoyed the experience. The thought of spending 8-10 hours in a coach on a structured tour with 2 college-aged sons was a miserable thought, so we searched out a private day tour through Viator who recommended Steve's organization. We customized the day and picked just the events no flower clock, please that would be of interest to the family. We opted for 10AM pick up at our Toronto AirBnB, headed to a few wineries, hit Skylon, Behind the Falls, ate lunch, and finished with Hornblower. Unlike structured tours, we didn't have to settle for a choice of the three main feaures - we did all three! Steve purchased all tickets in advance so we could head directly to the attractions, avoiding the ticket lines completely. We had drop off and pick up at the front door. Steve provided excellent advice for dressing for the November weather. Added bonus: because our driver, Daryl, grew up in the Niagara region and shared favorite spots for views of Ft. Niagara, Lake Ontario, and The Falls. Travel was by small mini-van which was equipped with cell phone chargers. Tour manager was available and responsive for planning. Our pick up was timely. Tips: Hornblower runs through December 4, 2016. Make Hornblower your last stop because you will get wet. Off-season may be cooler but the crowds are MUCH smaller.